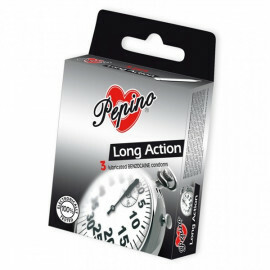 PEPINO condoms made from a natural latex with a special lubricant that helps to delay climax for men, and thus extends your intimate contact. Topped with a reservoir. Condoms that help you last longer! Transparent condoms made of natural rubber latex, cylindrical shape with reservoir tip. The special lubricant contains the active ingredient benzocaine 5% that has a slightly numbing effect and therefore prolongs the sexual experience.